We had a baby, for finally! Sophina Grace Driggs made her (overly dramatic) entry on March 9, at a whopping 9 lbs 7 oz. 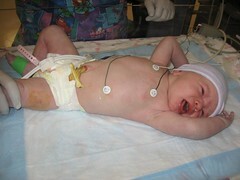 No stitches were involved, but the hospital and the NICU were. She gets released tomorrow, unless something weird happens. There are about a kazillion jillion pictures on Flickr. WOW she is so beautiful.. WHY so much drama? Is she ok? Oh, she is fine now. Just there was meconium in my water, then my labor kept stalling out, so we transferred to the hospital, and she had to be resuscitated, and then her white blood cell count was insanely high so she had to be in the NICU to get antibiotics for a week... far, FAR more excitement than I care for. But she is home now.